This is the inside cover of the new Vampire Hunter D manga, volume 2. THIS IS THE ONLY PLACE ON THE INTERNET WITH THIS SCAN IN HIGH RESOLUTION! Mayerling the vampire noble and his love, a beautiful human girl. The movie, Vampire Hunter D: Bloodlust, was based off of the book that this manga volume is from. Story by Hideyuki Kikuchi. Illustrations are by Saiko Takaki. My scan. Please give credit if you use for a wallpaper! Also, DON'T UPLOAD this scan to other sites! 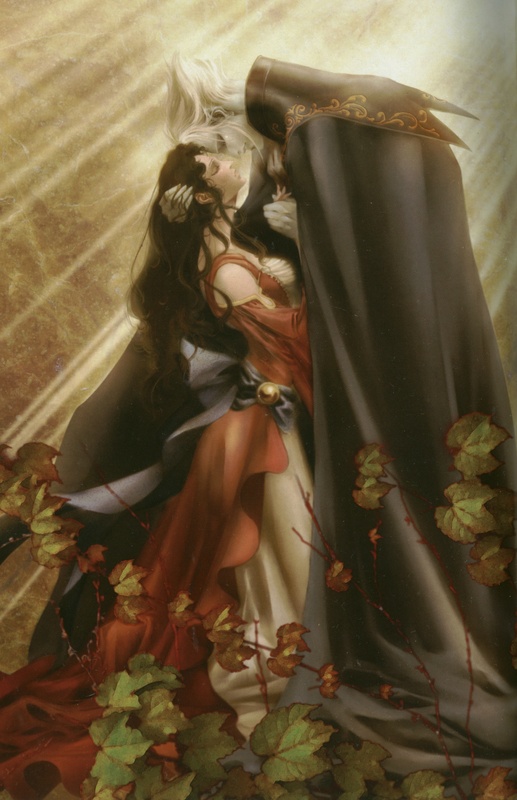 Browse Vampire Hunter D Gallery: Recent | Popular. That's GORGEOUS! Thank you for the scan! Awesome artwork here, thanks so much for sharing. Really nice picture. Love it. the most beautiful and tragic romance. thank you for the scan, it brings it across very well. Waaa Ils forment vraiment un beau couple! Gorgeous! I'm speechless! Thank you! is it official D art? what's the name of the book? BEST vampire-human couple ever! Moreso than Twilight! Btw,in Bloodlust, did the human girl actually die?